Flypay is quickly becoming an industry leader in ordering applications. The number of Flypay end users (people who use the relevant apps to make the orders) is closing in on 1million users, and is expected to be 3million by the end of 2016. 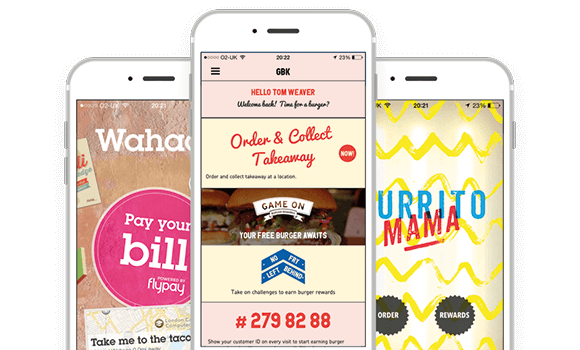 With the ability to pay at table, order and collect, order at table and even order the at bar all from your phone, it is clear why large chains such as Gourmet Burger Kitchen, Jamie’s Italian and Chilango all use Flypay. Flypay now integrates with embed signage seamlessly. With the ability to display orders on digital signage so that both customers and staff get on-the-fly(pay) information when new orders are received and when they are ready. A great example of this is in Chilango, where a click and collect function has been introduced, in turn increasing communication channels, efficiency and creating a positive brand experience. All of this alongside their digital menu boards, where they can advertise products; increasing sales and reducing wait times. With just a few clicks the Flypay widget can be added to any layout with ease. Additionally it can be completely customised to match company branding. Using a unique store id you gather and display store-specific order data directly from the Flypay app. Using core embed signage features such as advanced content scheduling, easy to manage and edit layouts and remote screen management, the Flypay widget now provides an awesome bolt on for any fast casual restaurant delivering digital menu boards with embed signage. It provides a fully integrated digital menu board and mobile ordering application solution to increase orders, sales, reduce wait times and improve consumer communication. If you’ve already got an account and want to add this awesome widget, get in touch with us here. If you haven’t got an embed signage account yet, sign up for a free 28 day trial today! embed signage is cloud based Digital Signage software that can publish digital signage content to an unlimited number of registered, compatible devices. The tools you need to deliver the content they won’t forget.